Wildfires Rage In California Wine Country, Leaving At Least 10 Dead : The Two-Way Wildfires forced residents in the wine country north of San Francisco to flee. At least 10 people have died and Gov. Jerry Brown has declared a state of emergency in eight counties. 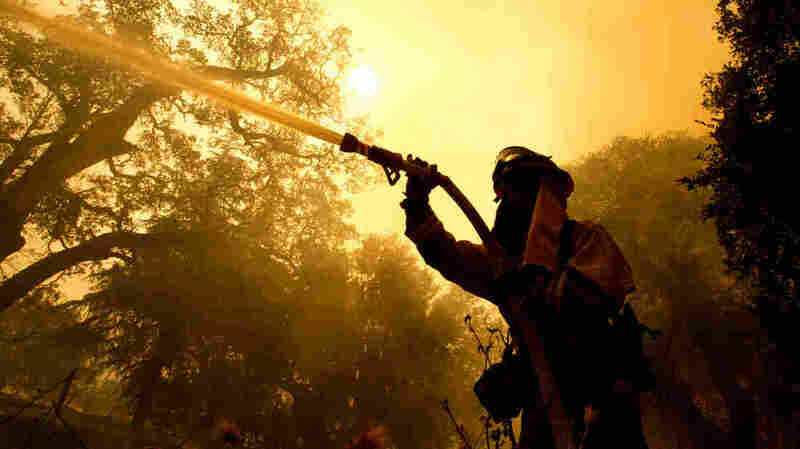 Napa County firefighter Jason Sheumann sprays water on a home as he battles flames from a wildfire on Monday in Napa, Calif. Wildfires whipped by powerful winds swept through Northern California sending residents on a headlong flight to safety through smoke and flames as homes burned. Updated at 8:08 p.m. ET. As many as 10 people have died in wildfires that erupted in Northern California over the weekend, forcing residents in the wine country north of San Francisco to flee as homes went up in flames. 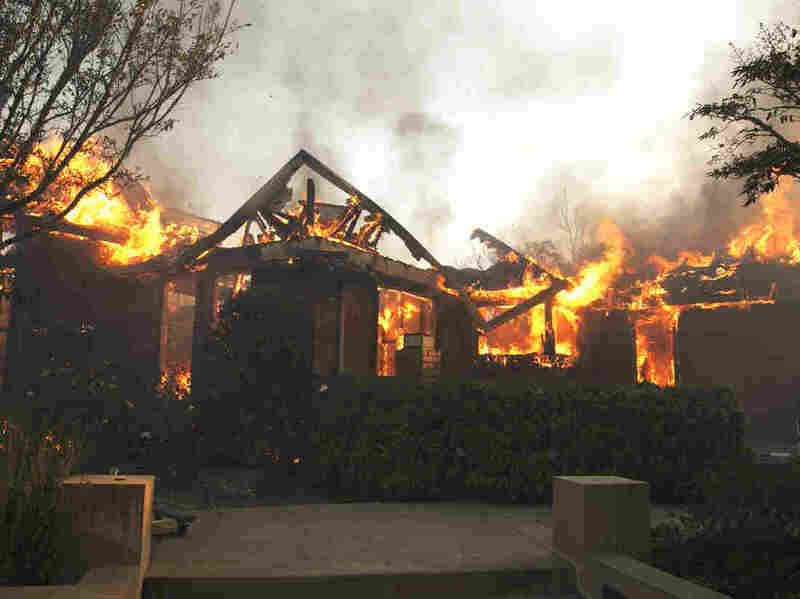 At least 1,500 structures have been destroyed and 20,000 people evacuated, according to member station KQED. According to CNN, seven people died in Sonoma County, one in Mendocino County and two in Napa County. Vanessa DeGier, a spokeswoman for St. Joseph Health, told the network that "more than 100 patients were treated at Napa and Sonoma area hospitals because of fire-related injuries and issues." "It was an inferno like you've never seen before," Marian Williams told The Associated Press as she escaped from the small Sonoma County town of Kenwood. "Trees were on fire like torches," she said. The fires were first reported Sunday and Gov. Jerry Brown on Monday declared a state of emergency in Butte, Lake, Mendocino, Napa, Nevada, Orange, Sonoma and Yuba counties. Mandatory evacuations were ordered in some areas. Flames from a wildfire consume a home Monday, east of Napa, Calif.
As many as 8,000 homes are threatened, hundreds of structures have been destroyed and two hospitals in Santa Rosa were evacuated. "One out-of-control blaze in and around northern Santa Rosa called the Tubbs Fire had burned at least 20,000 acres by 8 a.m. Scores of homes were lost in the Fountaingrove area east of Highway 101 and in the Journey's End Mobile Home Park on Mendocino Avenue. "The Fountaingrove Inn across the street from the mobile home park burned, as did the Hilton Sonoma Wine Country, a Kmart store, a McDonald's, an Arby's, an Applebee's and a Mountain Mike's Pizza. And that was just the beginning."